If you don’t have the desktop version of Lync, or don’t have a Lync account, you can use Skype for Business Web App to join a Lync Meeting from your browser. 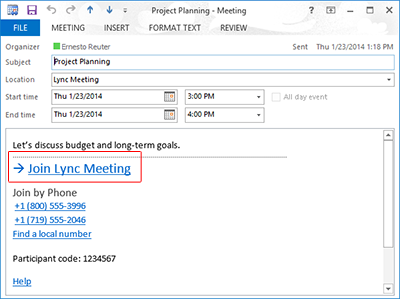 Go to Outlook > Calendar, open the meeting request, and select Join Lync Meeting. If the meeting request is from someone outside your company, join as guest. Just type your name, and then select Join the meeting. If the meeting is from someone in your own company, you can select Sign in if you are from the organizer’s company. Then type the same user name and password that you use to log in to your company’s network. Follow the prompts to install the plug-in and make sure to allow it in the meeting as well. Tip: If you’re having trouble joining the meeting, open an InPrivate Browsing session in Internet Explorer and try joining the meeting again. The Skype for Business Web App plug-in is required for audio, video, and screen sharing. You only need to install it once. Before you join the meeting, make sure Install Skype for Business Web App plug-in is selected on the sign-in screen. Follow your browser’s instructions for downloading and installing the plug in. For example, in Internet Explorer, select Run when you see the alert at the bottom of the browser window. Important: Install the plug in even if you plan to call in to the meeting by phone. The plug-in is also required for video and screen sharing. If you’ve already joined the meeting and the plug-in didn’t install, point to the phone icon and select Call to start the installation process. See also: Trouble installing the Skype for Business Web App plug-in? If the meeting request is from someone in your organization, you can install and use the desktop version of Lync to join the meeting. Contact your workplace technical support—typically the person who set up your Lync account for you—for the location of the Lync download. Important: To use the desktop version of Lync, make sure Internet Explorer is your default browser. In some cases you may want to join a meeting with Skype for Business Web App even if the desktop version of Lync is installed. Press Enter to join the meeting with Skype for Business Web App.